After waiting many years finally Blogger is up with yet another impressive SEO enhancement for all BlogSpot Blogs. Unlike previous times, Blogger users have the liberty to write custom URLs for their posts using Blogger in draft. You will not find this permalink tool in your post editor, if you are using blogger.com. This permalink tool can only be accessed from draft.blogger.com. Permalink is used to define the URL structure of a website, which points to a specific blog or website. Previous times, when we published a post it automatically generates a URL of 30 to 35 characters and occasionally these keywords were not Search engine Friendly which is illogical, but now you can create custom URLs with fluent keywords as you have complete control of the URL structure. After Search engine preferenceand 404 pages for blogger its one of the best featured ever released. Permalinks or Permanent links plays the most significant role in advancing your on-page SEO to the next level. When any one searches a keyword in a search engine, he will automatically get a list of those websites which has the same chunk of keywords either in the URL or in the post. For instance, if you are writing a post regarding Google but instead of writing anything related to Google in the permalinks you wrote Yahoo which is totally opposite to it. The procedure of creating customized permalinks is extremely straightforward and takes seconds to complete. 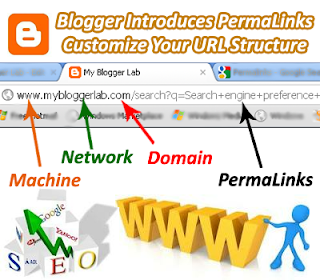 You don’t require any further work to enable permalinks on Blogger to do so follow the following instruction. Go to Draft.Blogger.com and Sign in to your Blogger Account. Now press the orange pencil button which says “Creates a New Post”. Then on the right side of your screen in the “Post Settings” you will be able to see a tool namely Permalinks. Now on clicking the Permalinks tool you will be able to see two options one Automatic URL and second Custom URL. Now write your keywords for example, Google-Is-Number-One. Remember don’t add your blog URL, just enter the targeted keywords. There are no limitations in neither automatic nor customized permalinks, which is remarkably overwhelming. Although Google only displays 65 to 70 characters of a URL while represents remaining URL with dots. Therefore, it’s crucial that you only write those keywords which are most needed and they should not exceed the character limit defined by Google. Use 4 to 5 rich keywords in your post. You should not exceed 70 character limits. A perfect permalink is usually concise and well target. Try to use most desirable keywords in your URL. By maintaining perfection is keywords, it will guide search engines about your targeted keywords. A user-friendly permalink not only captures the attention of your visitors but also create an enormous impact on Search engine optimization. Here are the few examples of correct and wrong permalinks. In this example, you can assume that the link is well formed with dashes, while the keywords strength is also correct and more importantly it is rich with prominent keywords. In this example, you can see how undemanding or illogical this appearing. Although, there is no problem with keywords but the underscores are ruining the whole URL. Usually these underscores are used by algorithms so when bots see a URL with underscores they get misguided and hence it affects their SERP. In the following video a user asked “Does the position of keywords in the URL have a significant impact on SEO?” For Example, mybloggerlab.com/search/Google is better then mybloggerlab.com/Google. According to Matt Cutts “It does helps a little bit to have keywords in the URLs. It doesn’t help so much that you should go stuffing tons of keywords into your URL. You know, if there’s a convenient way that’s good for the users where you have four to five keywords that might be worthwhile.” For more details check this video. Why I am Unable to add some characters? Answer: Google and other popular search engines only accepts few characters, which includes forward slashes (/), dashes (-) and colon (:). Never use underscores in your URLs because it create misconception in the minds of crawlers. Why I am getting errors Invalid characters: [ ] in Blogger Permalinks? Answer: This is happening because you are noting using dashes in your custom URLs. You are just adding keywords with space which is wrong instead of adding space in between two keywords use dashes. Why My Permalink Tool is not working? Answer: It is working perfectly for me but there are possibilities that Google is updating its features. Currently it is under observation, this is the reason you can only access it from draft.blogger.com. How Many Characters Accpect Custom Url ? It`s a best Seo Move from Google It helps In better Seo.